Every once in a while an original movie comes along that leaves a lasting impression on you and the masses for years to come. Jordan Peele accomplished such a feat with his first film ‘Get Out’. But how does his follow-up film ‘Us’ compare? 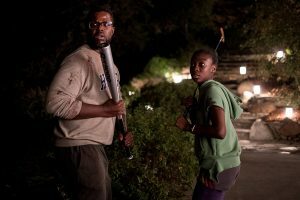 Us is a horror, thriller film written and directed by Jordan Peele and stars Lupita Nyong’o alongside Winston Duke. Jordan Peele’s Get Out was a surprisingly great film. Get Out is a film I went to see in theaters not knowing what to expect. I watched the trailer for the film once, I avoided reviews and essentially went to see the film blind. I used the same exact method for this film as well. Mostly due to the fact I had no idea what was going on when I saw the trailer for ‘Us’. The way Peele’s movie trailers are cut have a theme. He builds intrigue by showing you just enough to get you interested. At the same time, he avoids giving away the plot. I am not a fan of this tactic because I would rather know what the hell I am about to watch. But if the film turns out great, no harm no foul. The story starts off in the past, the 80’s to be exact, when a Young Adelaide Wilson (Madison Curry) is taken to a carnival pier with her parents (Anna Diop, Yahya Abdul-Mateen II). Young Adelaide gets separated from her parents while at the carnival and experiences a traumatic experience not revealed to the audience until later. One child therapy session later and the story is thrust into the present day. Young Adelaide is now grown up (Lupita Nyong’o) and has a husband (Winston Duke) and family. A family now on the road to their summer vacation…at the very same pier Adelaide experienced her trauma as a young girl. Adelaide is paranoid the entire trip. She knows trouble is afoot, and when nightfall comes, that is when the movie starts. At the very beginning of the film, the audience is given a piece of information. Below the surface, the entire continental United States has abandoned tunnels and subways. The purpose of many of those tunnels is unknown. In this film, the purpose of those tunnels is to provide shelter for its inhabitants, The Tethered People. These Tethered individuals here are doppelgängers of the Wilson family. They have shown up in front of the summer house drive-way that the Wilson’s are staying in. Hand-in-hand, these four mysterious figures standing in the darkness gave me the creeps. Lupita Nyong’o is great as the lead in this film. However, I laughed on the inside when I heard her speak as Red (Adelaide’s doppelgänger). A few people in the audience laughed out loud when they heard the most exaggerated raspiest voice ever heard in cinema. The spoofs are coming for sure. Any fear The Tethered People provide in their opening scene is completely ripped away by the non-stop comic relief of Gabe Wilson (Winston Duke). Jordan Peele’s claim to fame is his talent as a standup comedian. It’s natural for him to provide humor in his films. But I am undecided if ‘Us’ had too much humor, or if Peele chose to use humor at the wrong times. I prefer my humor in horror films to happen in between the horror scenes, not during. When this happens, the tones do not mesh well, and as a result, I cannot take the severity of the situation seriously. There’s a scene where the Wilson family comes face-to-face with their doppelgängers. The Wilson’s are held against their will by their doppelgängers, so Adelaide speaks up. She asks the doppelgänger family, “Who are you people?” Red replies, “We are Americans”. If I learned anything from watching all the Get Out theory videos on YouTube it is this; everything is a metaphor with a much deeper meaning when it comes to Jordan Peele. Here is my interpretation for the “We are Americans” line. The Tethered People come from underground living in less than ideal conditions. For every Tethered person, there’s a doppelgänger that looks exactly like them on the surface. I think Jordan Peele is saying no matter what your color, creed, or socioeconomic status is, at the end of the day, we’re all Americans. Tethered, or United rather by the good ole red, white, and blue. They are us, and “us” are them. The song, “I Got 5 On It” by rap artist, Luniz is a great song that is heavily featured in this film. But it’s inclusion felt random and served no purpose to the overall narrative of the film. However, the Tethered instrumental remix that played in the final act of the film was a welcomed addition. Leave it to Jordon Peele to turn a song about purchasing weed into something scary. All that aside, pay attention to the car ride scene to the beach when this song comes on. Adelaide is offbeat as she snaps along to the music. There’s a subtle detail in this scene that becomes clear at the end of the film that added a clever twist to the film. How does ‘Us’ compare to ‘Get Out’? It doesn’t. ‘Get Out’, much like ‘Us’, had clever metaphors with deeper meanings. But encoding metaphorical messages does not always translate into a great film. ‘Get Out’ resonated with me because the thought of being a prisoner inside your own body is scary to me. Being trapped inside of The Sunken Place for the rest of your life sounds like an awful way to go. ‘Us’ didn’t provide anything close to what ‘Get Out’ did. In fact, I would go as far as to say that ‘Us’ is a basic horror film that bored me. If you enjoyed my Us movie review feel free to check out my monthly podcast, Almost First, covering similar content streaming on all major platforms.